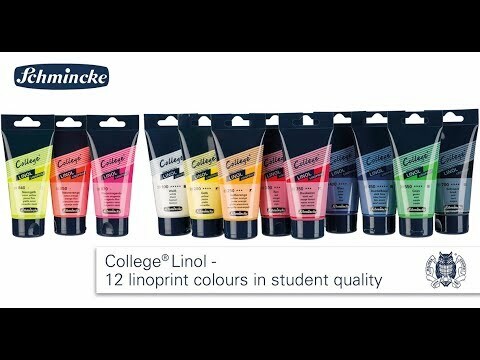 The popular College® Lino colours are ideally suited for didactic purposes. They have now been extended to acompact range of 12 colours. Good miscibility with each other and with all LINO mediums. This odourless and water soluble lino print colour is easy to use and thus offers an easy introduction to the technique of lino printing. The selected colours offer even printing results when used directly from the tube or mixed with each other, and are suitable for educational purposes as a result of the colour properties and the good value for money. The colour palette can be expanded extensively by mixing the colours. All colours can be mixed and combined with the Schmincke aqua lino print colours, as well as with aqua Lino mediums from the professional range. Thus, even beginners in linoprint can work with Schmincke colours and can achieve beautiful printing results.